The Murray River transcends Australiain borders. By it's very nature the Murray River binds and connects southern Australia. Just over 2,500 km from the very top near Albury/Wodonga (New South Wales and Victoria) to it's mouth at Goolwa (South Australia). It's in the heart and our souls off Australians. Creating an unexplainable feeling which means something different to each person yet it binds us all. 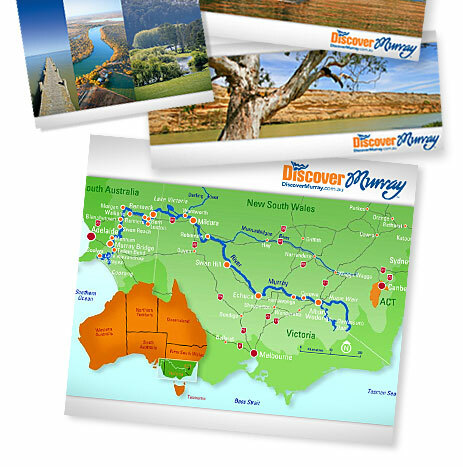 The Murray River experience is unque and can be found here. From it's crowded red gums and steep banks near Echuca Moama to the golden cliffs and expansive width in mid South Australia. The Murray is peaceful, slow, tranquil and steady. It allows us to unwind, escape, chill out and recharge our drained batteries. The essence of the Murray is about taking time out. The "relaxed nature of the Murray" go with the flow feeling. We've endeavoured to create the experience of a relaxation online while still addressing the important needs and issues of the river community. For more information click here to visit Discover Murray or visit some of the external links below.